Padraig Harrington. Picture: Fran Caffrey/www.golffile.iePadraig Harrington took just 24 hours to change his tune on Atlanta Athletic Club. The Dubliner played the front nine on Monday and predicted low scoring on a 7,400-yard track he described as a “nice playable course.” But after tackling the back nine in 90 degree temperatures he’s now bracing himself for a wild ride. He said: “It’s a lot tougher. Much tougher than the front nine. “The 10th, 11th and 12th are okay but from the 15th on it’s a different story. He knows there is no hiding place on the tight, 507-yard 18th where water lurks off the tee and in front of the green. Padraig Harrington played well on day one before taking a double bogey at the last. Photo by Luke Walker www.golffile.iePadraig Harrington played sublimely for 17 holes before falling victim to the thing he feared most in his first start of the season - mental error. All things considered, his four under par 69 on The Links at Fancourt was a laudable effort for a man who is under pressure to come out firing on all cylinders if he is to take his place in the field in Tucson and boost his chances of making the Ryder Cup team for the seventh time. Padraig Harrington believes that driving it straight will be the key to winning the Open at Royal Lytham and St Annes in July.Two-time champion Pádraig Harrington is bracing himself for a serious driving test in The Open when he chases a third Claret Jug at Royal Lytham and St Annes from July 19-22. The 40-year old Dubliner, who finished 18th in 1996 and 37th behind David Duval on The Open’s last visit to the Lancashire course in 2001, played a practice round at the 7,086-yard, par-70 track on Wednesday. Padraig Harrington is happy - very happy - with his game heard into the Open. He also has a new (temporary) endorsement on his cap in GoFuzed.com. The Dubliner is an investor in the company, which offers social media solutions for business. 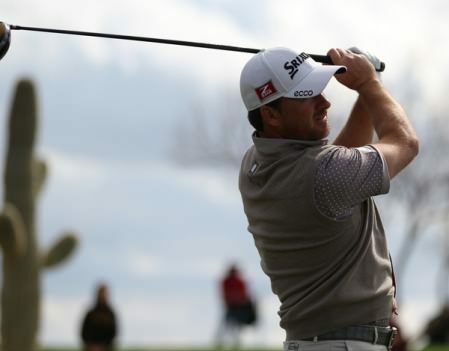 Picture Fran Caffrey www.golffile.iePadraig Harrington insists he’s back with a bang as a major contender and ready to join the immortals with three Claret Jugs to their name. McDowell - "18 is a real ball tightener"